Chenoa McElvain has been itching for a grand prix win at HIPICO Santa Fe since the inception of the Summer Series. And as the daughter of one of the founding families, Guy and Sharon McElvain, Chenoa has seen the buckles given to the winner for years because the sterling silver pieces reach deep into Grand Prix de Santa Fe’s past. Grand Prix de Santa Fe, a nonprofit organization dedicated to supporting several New Mexico causes, formed in 2004 and has since donated more than $150,000 to regional and local charities. The belt buckle—designed and created by Mortenson Silver and Saddles in Santa Fe—won today is the same as was presented at the original show. And the only way to get this special buckle is to win it—no small feat! Course designer Hector Loyola filled the arena with as many jumps as much as possible to challenge the riders. While the jumps were straightforward, aside from a few questions such as oxer to oxer and a triple bar to a vertical, the real challenge was time. “The time was the hardest part. The rest were simple questions. There weren’t really places to cut except in one spot,” he said, applying the mindset that each course should be designed for the confidence of horse and rider. The time allowed in the first round was a tight 92 seconds, which caused many time penalties. The Grand Prix de Santa Fe boiled down to four riders and eight horses—McElvain, Jenni McAllister, Colleen Acosta and Sydney Luzicka—as they faced the biggest obstacle of all, the tight time on the clock. McElvain caught a rail on her first entry, Voila, and Acosta had a 4-fault performance on MTM Lights Out. McAllister pulled 4 faults on LEGIS Venice, the winner of last year’s Grand Prix de Santa Fe. Double-clear jump off rounds included Acosta’s second ride HIMINI, Luzicka on Willow Catkin, and McAllister with Colvados, Week 3’s red ribbon winner. It took more than double clean to finish in the top two—McAllister’s third ride on Escada VS, Fiesta Week’s grand prix winner, and McElvain’s second ride, Wallstreet RC, took on the ring like speed demons. 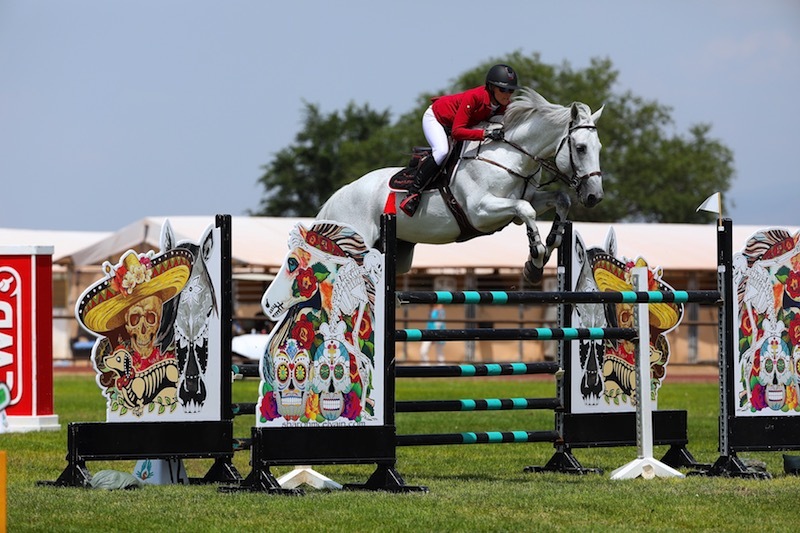 Chenoa McElvain and Wallstreet RC earned a silver belt buckle for their victory in the $40,000 Grand Prix de Santa Fe. Photo by Sharon McElvain. McElvain beat McAllister’s time by less than half a second. Following the top two placings, McAllister took yet another ribbon on Colvados. Luzicka—who rode the entire course without stirrups—grabbed the fourth-place finish on Willow Catkin and Acosta snagged the fifth-place ribbon aboard HIMINI. Each of these teams have been competitive with impressive placings in several classes throughout the Santa Fe Summer Series. In the jump-off, the pair confidently galloped to each jump, was careful around the turns and powered off the ground to clear each obstacle with room to spare. “My horse was just really on it today! I didn’t touch the reins. I just galloped and trusted it—that’s what he likes to do anyways. So any chance I had, I just galloped! In the turn from jump 6 to 7, I planned on doing an eight, but ended up doing the seven, because he turned so quickly. And I knew the other turn after the Dachshund [themed] in-and-out was going to be really tough, because everyone was getting wide, so I just grabbed my right rein in the air, and he turned so fast—he was just with me today!” said McElvain. One of the most challenging parts of riding the stallion is to get him back and organized after long gallops, “He has such a big stride, but now he’s listening so much more—if I just settle, he’s there,” she explained. When McElvain cleared the final oxer, the crowd went wild. Her mom was jumping up and down, her New Mexican supporters were ecstatic, and Wallstreet RC was very satisfied with himself. The young professional celebrated the first win in her home town with a bold cantering lap peppered with pats and huge smiles, receiving hugs on horseback from her dad, and her mom jumping up and down in the crowd. “This is where I was born, where I’m from and where I’m going to be—it means a lot. And in front of my grandparents who are 80 and having everyone be able to be here to see it—I just feel so elated and incredible and happy,” said the newly minted 2018 Grand Prix de Santa Fe winner.